Home » Posts Tagged "Bush J. W."
Sáenz, P. J., Cristea-Platon, T., & Bush, J. W. (2018). 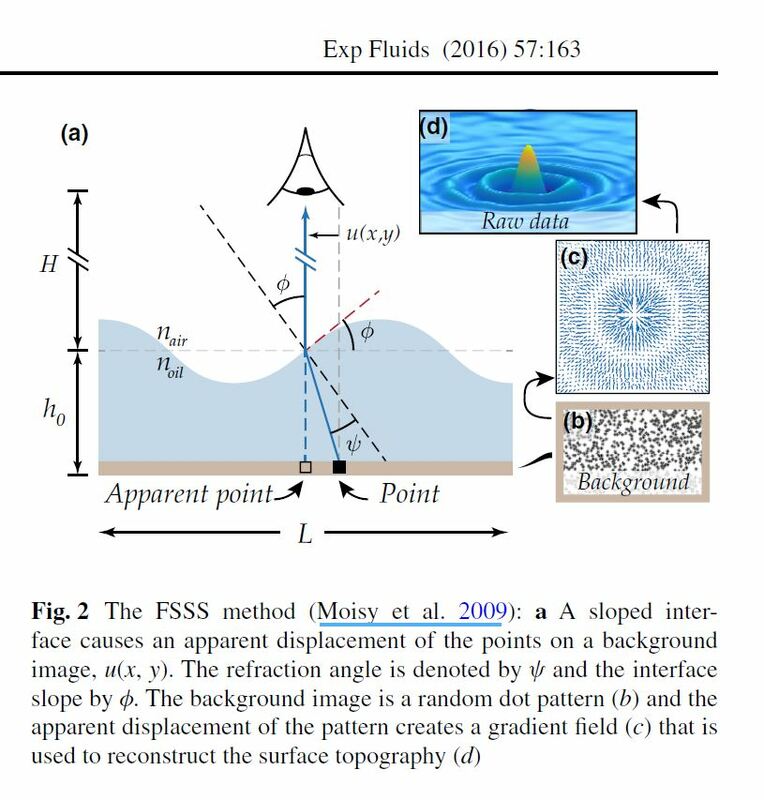 Statistical projection effects in a hydrodynamic pilot-wave system. Nature Physics, 14(3), 315. A technical entry by the american team reproducing the synthetic Schlieren free surface measurment already implemented successfully by the Paris Team. Damiano, A. P., Brun, P. T., Harris, D. M., Galeano-Rios, C. A., & Bush, J. W. (2016). Surface topography measurements of the bouncing droplet experiment. Experiments in Fluids, 57(10), 163. A free-surface synthetic Schlieren (Moisy et al. in Exp Fluids 46:1021–1036, 2009; Eddi et al. 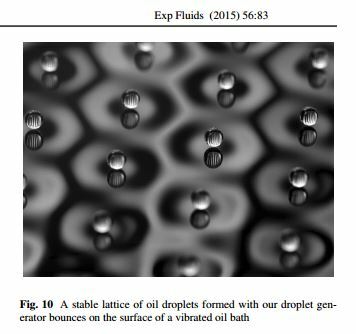 in J Fluid Mech 674:433–463, 2011) technique has been implemented in order to measure the surface topography generated by a droplet bouncing on a vibrating fluid bath. This method was used to capture the wave fields of bouncers, walkers, and walkers interacting with boundaries. 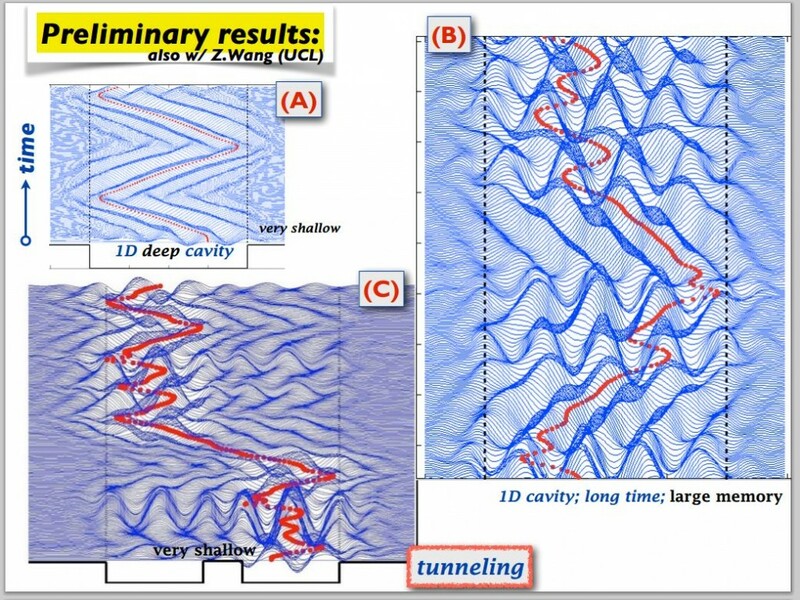 These wave profiles are compared with existing theoretical models and simulations and will prove valuable in guiding their future development. 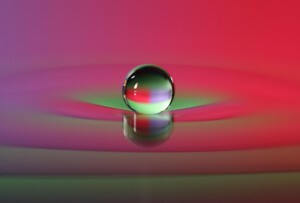 Specifically, the method provides insight into what type of boundary conditions apply to the wave field when a bouncing droplet approaches a submerged obstacle. Labousse, M., Oza, A. U., Perrard, S., & Bush, J. W. (2016). Pilot-wave dynamics in a harmonic potential: Quantization and stability of circular orbits.Physical Review E, 93(3), 033122. Bush, J. W. (2015). 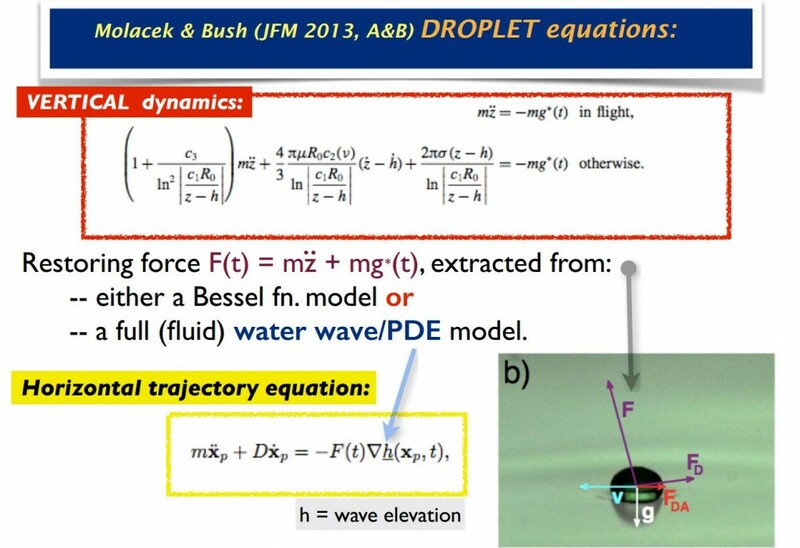 Pilot-wave hydrodynamics. Annual Review of Fluid Mechanics, 47, 269-292. 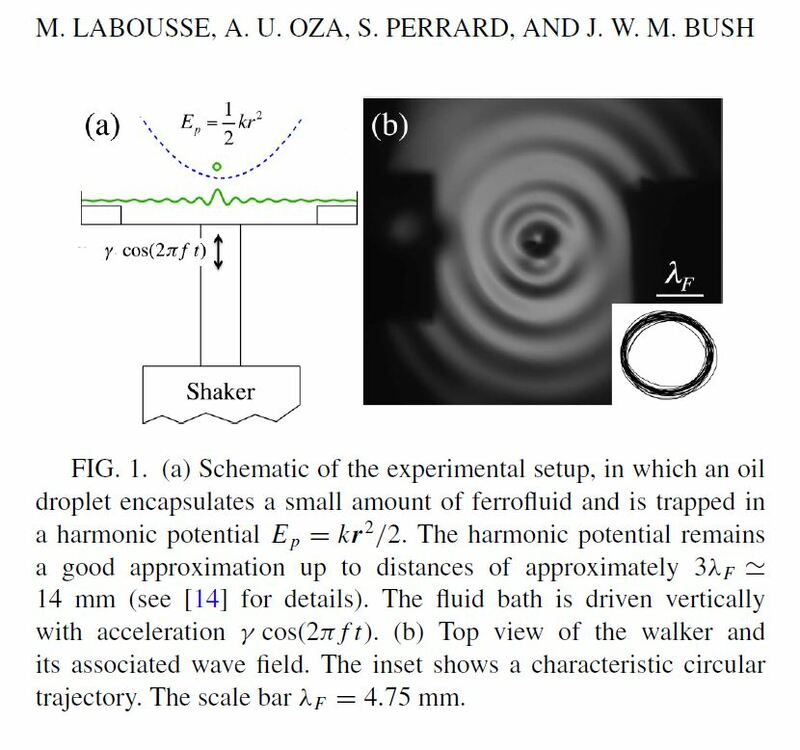 Yves Couder, Emmanuel Fort, and coworkers recently discovered that a millimetric droplet sustained on the surface of a vibrating fluid bath may self-propel through a resonant interaction with its own wave field. This article reviews experimental evidence indicating that the walking droplets exhibit certain features previously thought to be exclusive to the microscopic, quantum realm. 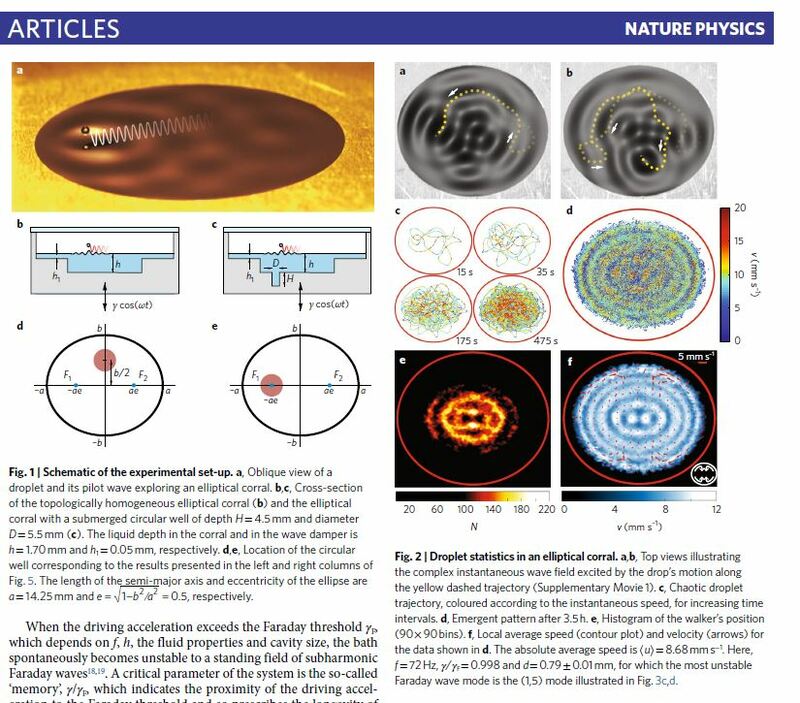 It then reviews theoretical descriptions of this hydrodynamic pilot-wave system that yield insight into the origins of its quantumlike behavior. 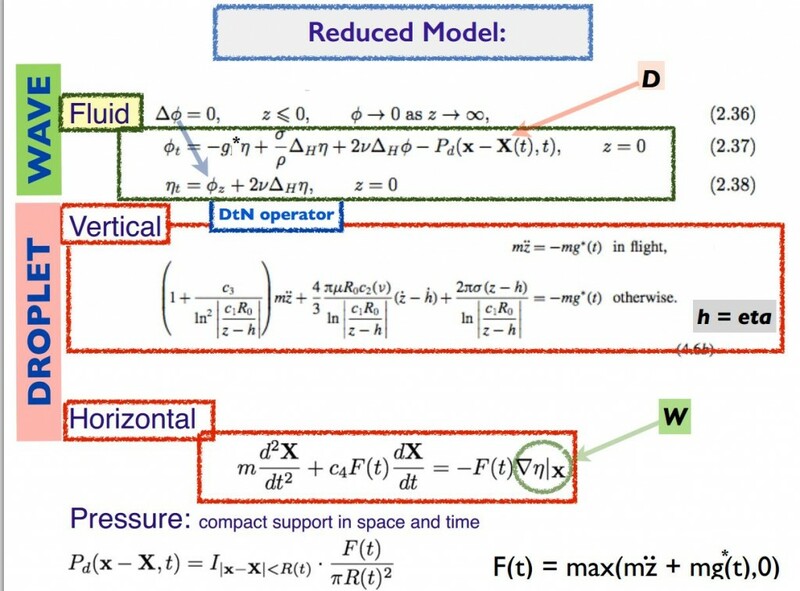 Quantization arises from the dynamic constraint imposed on the droplet by its pilot-wave field, and multimodal statistics appear to be a feature of chaotic pilot-wave dynamics. I attempt to assess the potential and limitations of this hydrodynamic system as a quantum analog. This fluid system is compared to quantum pilot-wave theories, shown to be markedly different from Bohmian mechanics and more closely related to de Broglie’s original conception of quantum dynamics, his double-solution theory, and its relatively recent extensions through researchers in stochastic electrodynamics. Bush, J. W., Oza, A. U., & Moláček, J. (2014). The wave-induced added mass of walking droplets. 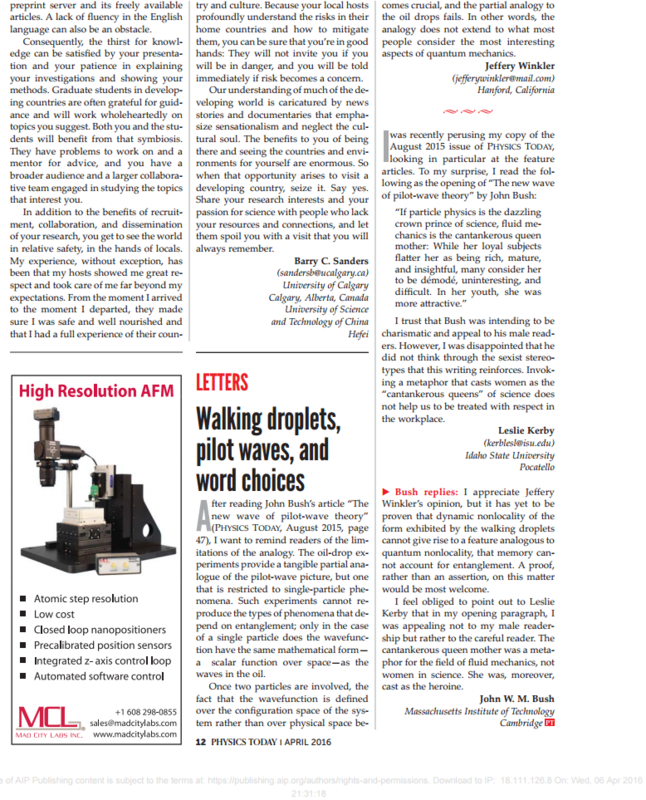 Journal of Fluid Mechanics, 755, R7. Harris, D. M., Liu, T., & Bush, J. W. (2015). A low-cost, precise piezoelectric droplet-on-demand generator. Experiments in Fluids, 56(4), 1-7. We present the design of a piezoelectric droplet-on-demand generator capable of producing droplets of highly repeatable size ranging from 0.5 to 1.4 mm in diameter. The generator is low cost and simple to fabricate. 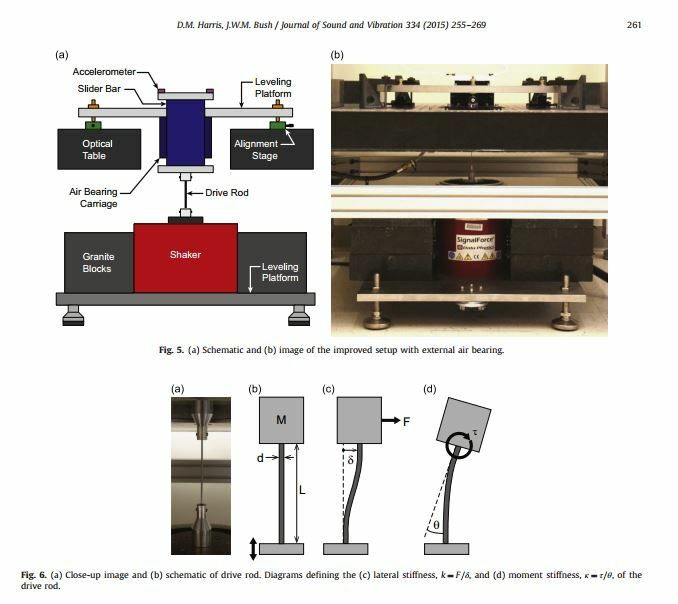 We demonstrate the manner in which droplet diameter can be controlled through variation of the piezoelectric driving waveform parameters, outlet pressure, and nozzle diameter. Oza, A. U., Harris, D. M., Rosales, R. R., & Bush, J. W. (2014). 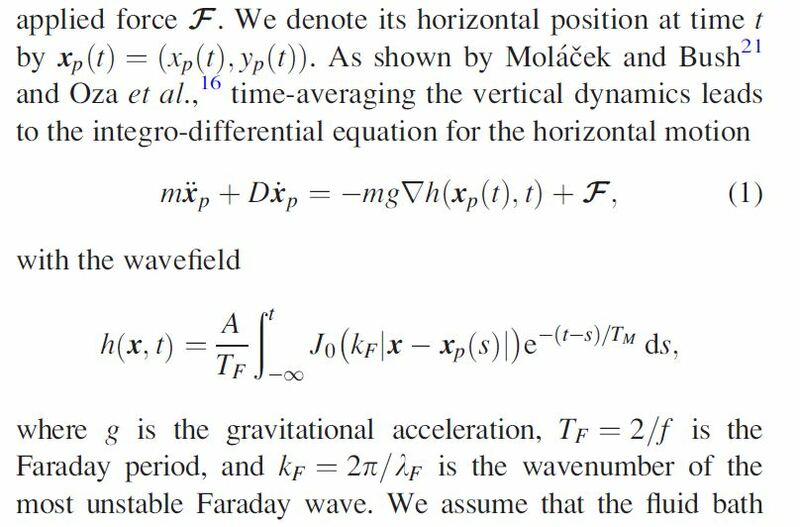 Pilot-wave dynamics in a rotating frame: on the emergence of orbital quantization. Journal of Fluid Mechanics, 744, 404-429. Harris, D. M., & Bush, J. W. (2014). 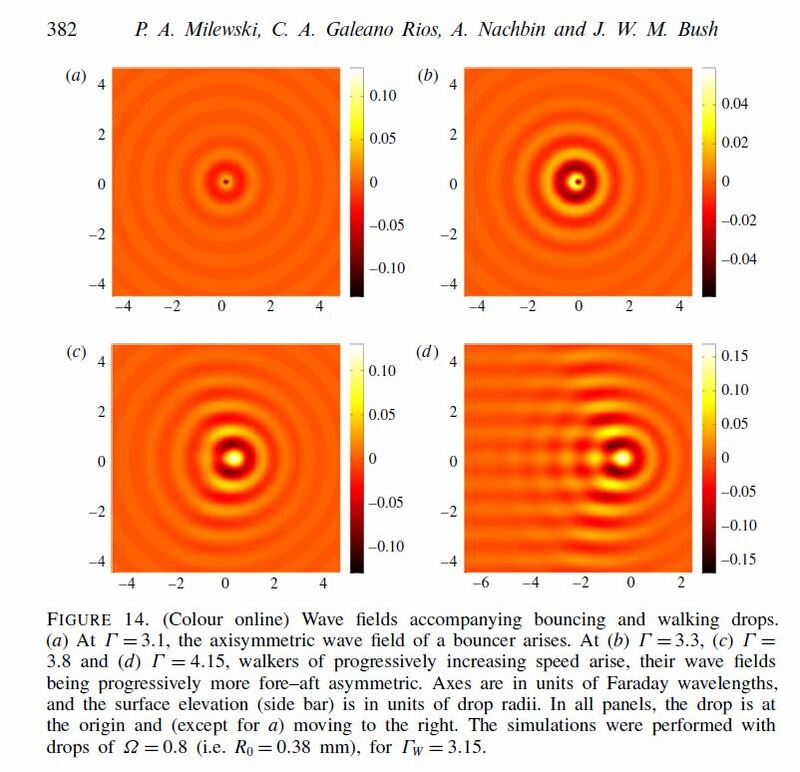 Droplets walking in a rotating frame: from quantized orbits to multimodal statistics. 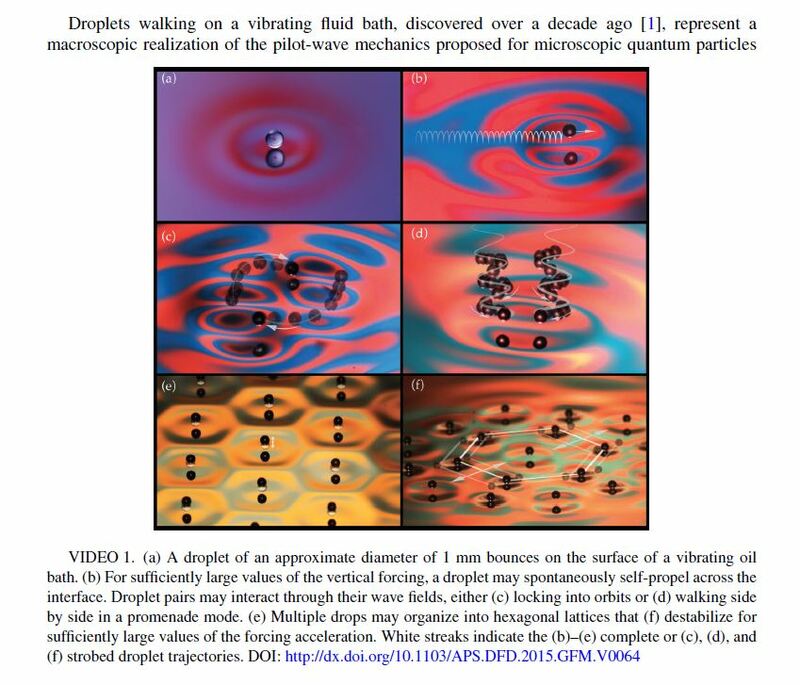 Journal of Fluid Mechanics, 739, 444-464.
the persistent dynamic influence of the unstable orbital states. Oza, A. U., Rosales, R. R., & Bush, J. W. (2013). 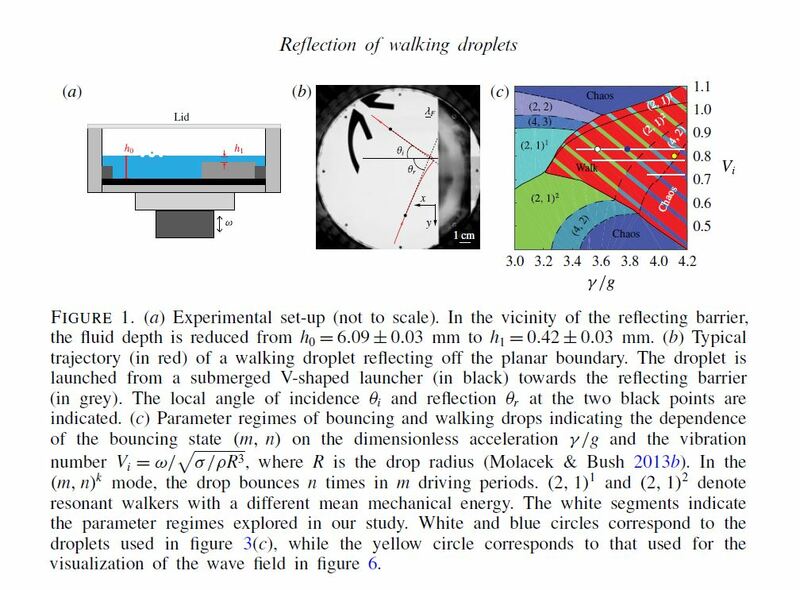 A trajectory equation for walking droplets: hydrodynamic pilot-wave theory. 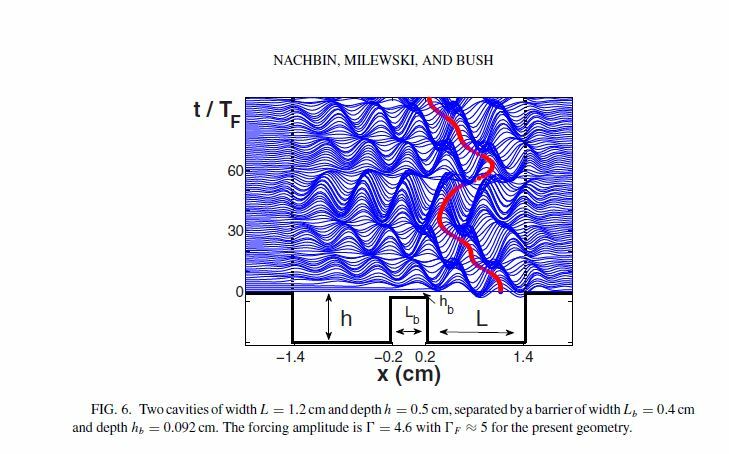 Journal of Fluid Mechanics,737, 552-570. Moláček, J., & Bush, J. W. (2013). Drops bouncing on a vibrating bath. Journal of Fluid Mechanics, 727, 582-611.